If we talk about electrical safety, a grounding system is essential to report safety to people and to the protection of equipment sensitive to overvoltages. Hence the importance of the earth resistivity meter, to verify that a grounding system works properly. The AMRU-20 is a device that allows to measure the earthing by the 3-pole method, or the 2-pole. With this equipment we can also measure the continuity of the equipotential protection connections with a current of 200 mA (complies with IEC 61557-4). The standard equipment of the AMRU-20 meter has electromechanical compatibility according to IEC 61010-6-3 and IEC 61000-6-2 and includes everything necessary to carry out the measurements. One of the advantages of the equipment is that being portable, the operator has great mobility and compact dimensions allow it to be handled in a simple way to access any point. 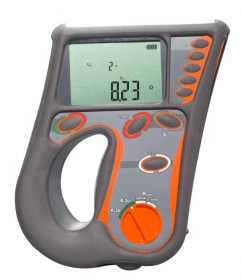 The AMRU 20 resistivity meter is a portable and light equipment; with compact dimensions and electromagnetic compatibility according to IEC 61000-6-3 and IEC 61000-6-2.